You may be thinking... "why do we need a page about an old warehouse in a backstreet in Hereford?" Well, whilst our warehouse is certainly a building from a bygone era, it never ceases to amaze me the number of customers who reminisce about their younger days and the connections they have with this old shed. Originally built in the 60’s (we believe) by one of Hereford’s biggest fruit & veg companies ‘Horace Sullivan’, it was tailor-made to suit their needs. The warehouse was built with a large basement cellar area which I’ve heard many times was used as a banana ripening room. The vast area we use as the main showroom was where the lorries were stored. The office my Dad uses today, which has good visibility across most of the warehouse, was also used by Horace Sullivan probably for the same reason - it is an ideal place to keep an eye on the work progress, bearing in mind this is the days before CCTV - but Dad now has both! 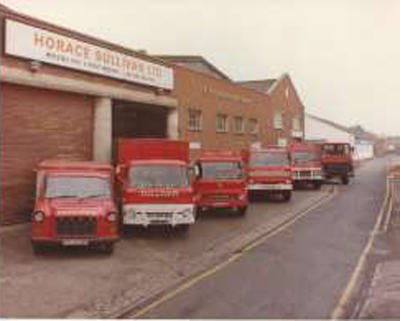 After Horace's death the company closed and the warehouse saw many different uses, but mainly retail due to its vastness, location to the city centre and its great parking facilities. Throughout the 80’s furniture retail started and by the late 80’s it was home to around 10 different businesses - a kind of mini market of businesses and the warehouse was known then as the ‘Banana House’ due to its original nature of fruit & veg trading. This warehouse is one the main assets for us - we have the space to hold large stocks, have ease of access for customers with ample parking and our great location in the heart of the city. Due to its warehouse nature we have low overheads, meaning we can keep our prices low. The only thing we should point out: if you’re visiting us during the colder months it may be wise to bring your coat, as this place was not designed for warmth!